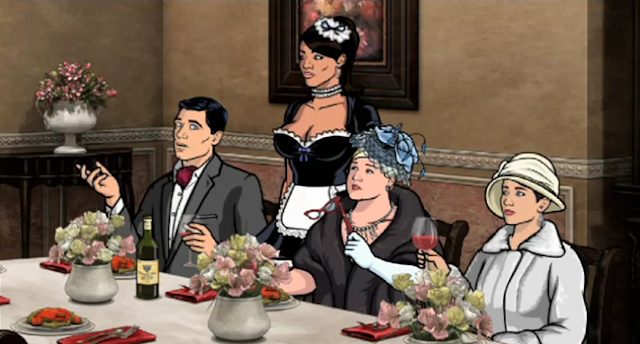 Archer, Lana, Pam and Carol in "Lo Scandalo," one of the many brilliant episodes of the show's third season. Source. After last week's terrific Archer season finale, "Space Race, Part II," I was perusing the AV Club's recap of episode. I was struck by the final line, in which Todd VanDerWerff - one of my favorite TV writers and, more importantly for the purposes of this article, a die-hard fan of Community - said that FX's absurd spy series was "the best comedy on TV." Then I started to think about it, and I realized that Archer might, in fact, be the best comedy on TV. At the very least, it's the funniest comedy on TV. You might think that, for a comedy, being the funniest show on TV would automatically equal being the best. That sort of depends what you want out of your comedy. As I have mentioned before, I am a big fan of comedies that give the viewer big emotional payoff, a quality that is often at least somewhat at odds with the business of being funny. Thus, while Community is not as consistently, hysterically funny as Archer (the only show that can give the spy series any competition is Happy Endings, which is slightly less consistent), it gets me because it aims for the heart in addition to the funny bone. That probably explains why some of my favorite Community episodes are some of the least laugh-out-loud funny: "Mixology Certification," "Critical Film Studies," "Documentary Filmmaking Redux," and others. And there are certainly a few Archer episodes that aim for something a little deeper than just making you laugh, like the second season finale "Double Trouble" and this year's "Skin Game." In general, however, the characters are just too despicable to form an emotional connection with. Which is totally fine, because many of the show's most explosively (sometimes literally) funny moments would be impossible were it not for the hilariously terrible people who work at ISIS. All that said, Archer makes me laugh harder than any other show on television, and the third season was a nearly flawless comedy gold mine. There were so many spectacular moments that I was in danger of laugher-induced asphyxiation for most of any given episode: watching Sterling Archer (H. Jon Benjamin) scream at an ocelot named Babboo, first out of excitement and then out of anger at the way the animal betrayed him; Cheryl (Judy Greer, who may also be named Carol) spending an entire half-hour repeating "Just like the gypsy woman said!" after every bizarre turn of events; Malory's (Jessica Walters) relationships with Burt Reynolds, the prime minister of Italy, and an astronaut; a running gag about Pam (Amber Nash) being amazing in the sack; and so, so many others. It doesn't hurt that creator Adam Reed and the writers can construct a half-hour episode like nobody's business. (I'm starting to suspect that they and the writers of The Vampire Diaries are the same people, since both shows blow everything else out of the water when it comes to plotting.) From the sort-of murder mystery "Lo Scandalo" to the riotous, train-set "The Limited" to the crackling two-part finale, Archer's plots are lean and streamlined while still containing enough breathing room to allow for the sharpest gags this side of Arrested Development. And that's not even getting into the best voice cast on television. Benjamin, Walters, Greer, Nash, Aisha Tyler, Chris Parnell, Reed and Lucky Yates have some of the greatest voices out there, to the point where hearing just a snippet of Benjamin's raspy shrieks of delight and anger or Walters' frosty put-downs makes me giggle. Honestly, I can't really think of a better way to sum up just why Archer is so funny than to go directly to the show itself. So here's a clip of Sterling Archer using a raw steak in an attempt to find an ocelot. Enjoy!